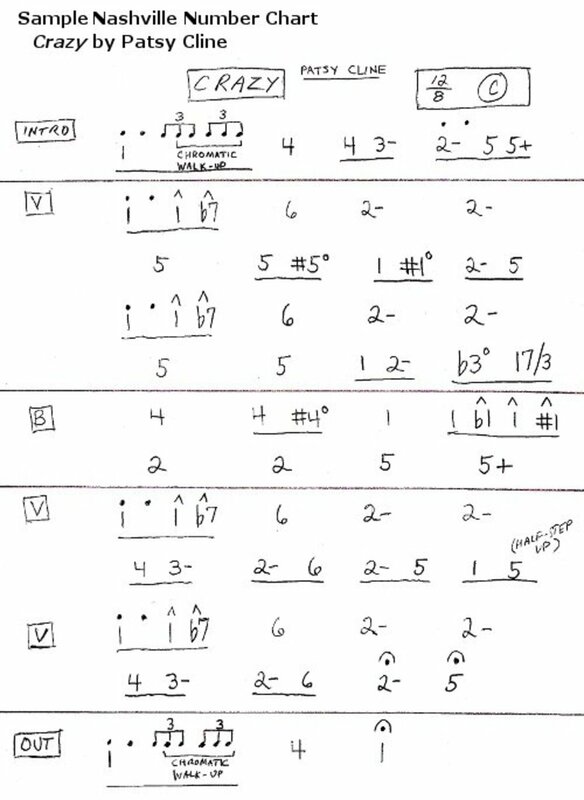 The Nashville Number System is a flexible method of musical notation that was developed by Nashville musicians as a quick way to chart songs in the studio. Musicians hoping to become part of the Nashville music scene absolutely need to know it, but the system is not solely for country music. Musicians and songwriters in all forms of popular music can use it to quickly put their ideas on paper and share them with other musicians. The method is becoming so widely used that it is now being taught in some colleges, including the Berklee College of Music in Boston. The system is not a formal system with well-defined rules, and this is actually one of its strengths. Musicians can tailor charts to their own needs. Some may only require a bare-bones chart, while others may want to include more detail. There are some general principles, however, that all charts will share, which are explained below. The heart of the system is the use of numbers, rather than chord names or roman numerals, to indicate chords. The numbers refer to the root note of the chord, and are based on the degrees of the scale being used in the song. To use the Nashville Number System, then, you need to know the notes of the major scale in every key. Thinking of chords in terms of numbers forces you to consider a chord's function, rather than thinking of it as a specific chord. A G chord, for example, plays a completely different role in the key of G than it does in the keys of C or D. Knowing the chord's function enables a musician to create better embellishments and improvisations for that chord. The main benefit of the system is that it can be used in any key without changing the chart. There are many reasons why a musician would have to transpose (change the key) of a song. When this happens, charts written in standard musical notation would have to be completely rewritten. Nashville Number System charts, on the other hand, require no change at all. This is important because studio musicians (and often live musicians, as well) are often called on to transpose a song on the spot. The sample chart for Crazy at the top of this article indicates the key of C and a 12/8 time signature. A song's time signature and any other performance notes a musicians wants to add are written at the top of the page. Once the key is determined, it is usually written at the top, as well. As a song's arrangement comes together, these performance elements may change. It's important that the information at the top is kept up to date and reflects the most current arrangement. In the key of C, the "17/3" chord in the sample chart would be a C7 chord with an E note in the bass. 1dominant means a flatted 7th is assumed in addition to the extension indicated. The "b7" chord seen on the chart for Crazy would be a Bb chord in the key of C.
Chords based on notes outside the of the key are indicated by sharps and flats before the number. Some put it after the number, but putting the sharp or flat before the number helps keep the notation after the number clear and consistent. It's also consistent with the way musicians usually refer to these notes. In most cases they'll say "flatted third" (or "lowered third"), not "third flatted". Nashville Number charts usually do not include lines, or bars, to separate measures. Each number on the chart is assumed to represent one full measure. Multiple chords in a single measure are underlined or surrounded by parenthesis, depending on the person making the chart. Less common is dividing chords in a measure by putting slashes between them, which could easily be confused for an alternate bass note. In the sample chart, triplet notation is used in the intro to show the timing of a passage in the first measure. Items that share a measure are underlined, and each line of the chart contains four measures to make the chart easier to read. If the chords are not to be evenly divided among the beats in the measure, dots above the chords indicate beats, one dot per beat. A chord to be played for three beats will have three dots above it, and so on. Some musicians use actual note values (quarter note, half note, etc) above the chords to indicate the timing, and full rhythmic notation, including note values and rests can be used for more complex rhythms. The sample chart uses plain English ("chromatic walk-up" and "half-step up") to refer to what happens at certain points in the song. Symbols may be combined. A number inside a diamond with push symbol above it, for example, means to "push" the chord, then hold it full for the full amount shown (not counting the push). Standard musical symbols such as repeat signs or ties are often used, and instructions are sometimes simply written in plain English. The sample chart uses "V" to indicate verses and "B" to indicate the bridge, and the sections are clearly separated with a line. Nashville Number charts are usually clearly divided into sections, such as verse, chorus, bridge and so on. Intros, solos and codas are also clearly indicated. The number and placement of these sections varies from song to song, and clearly identifying each section gives an overview of how the song, as well as each of the individual sections, are structured. One of best features of the Nashville Number System is that the charts can be as detailed as you want. It allows you to convey information about the song while still leaving the musician room (as much or as little as you want, based on how detailed you make the chart) to add embellishments, variations or improvisations of their own. Experienced studio musicians are often called on to make up their own parts on the spot. Other times an arranger may want to specify exactly what to play. The Nashville Number System can accommodate both situations, and everything in between. I hope this introduction has been helpful. If you really want to dive in and learn more about this system, I recommend Chas Williams' book The Nashville Number System, which is used as a text at Berklee College of Music in Boston, as well as at other colleges and universities around the country. Mhatter99, the system isn't that well-known outside of Nashville. Studio musicians there developed it back in the late 50s, and pretty much everyone in that town uses it now. Its usage seems to be catching on these days. It's a pretty neat system once you get the hang of it. I studied music 14 years and this is the first I heard of this. Just shows to go ya. Thank you for bringing me up to speed. Glen, I think the chart is perfect in its imperfection,...just like those that get used in actual music studio, live concert, or rehearsal environments. Thanks K9. I know the handwritten chart up at the top of the hub isn't very pretty. I thought about making a nicer one, but most NNS charts are handwritten, and look pretty much like that (or worse), so I went ahead and used that one. Glad you enjoyed the hub. Thanks for stopping by. Doc, this is an amazing hub that any musician can benefit from. The Nashville Number System is brilliant! It makes perfect sense when, as you note, not all singers sing in the same octave , thus a quick revision in the face of a studio recording or an on-the-fly live concert would prove a seamless endeavor! Great layout, love the separator bars and the information in remarkably unique as well as musically valuable. Up and more!